Hello, and welcome to the website of Mike Pollitt ARPS. I hope you enjoy looking at my images. I have been taking Photographs for many years so have built up quite a collection. My first camera was a Helena 35 followed by a Pentax ME Super (I think most people had one of those at one time!) A Pentax Super A was the last one I owned in the Pentax range before moving on to Nikon. A friend asked me if I would try and sell a Nikon F801 body he no longer wanted so I took it and asked around likely buyers. At this time I was having eye problems so in the end I bought the F801 for myself thinking I may need auto focus myself soon!. I later bought a Nikon FE as a second body. My first digital camera was a Nikon Coolpix 995 a really great little camera, but with the need for more pixels a Fujifilm S1 arrived followed by a Nikon D200, D300 to my present camera a Nikon D300s accompanied with a D80 as a second body. I also have a Nikon D70s that has been converted to Infra Red a medium which I love. My lens collection to date is Nikon 10.5mm Fisheye, Tokina 12-24mm, Nikon 18-105mm, Sigma f2.8 70-210mm with 1.4x converter and Sigma 105mm Macro lens. I also have a Nikon SB 600 flashgun. I am a member of the Southport Photographic Society in the North West of England, and have been an active member for many years. 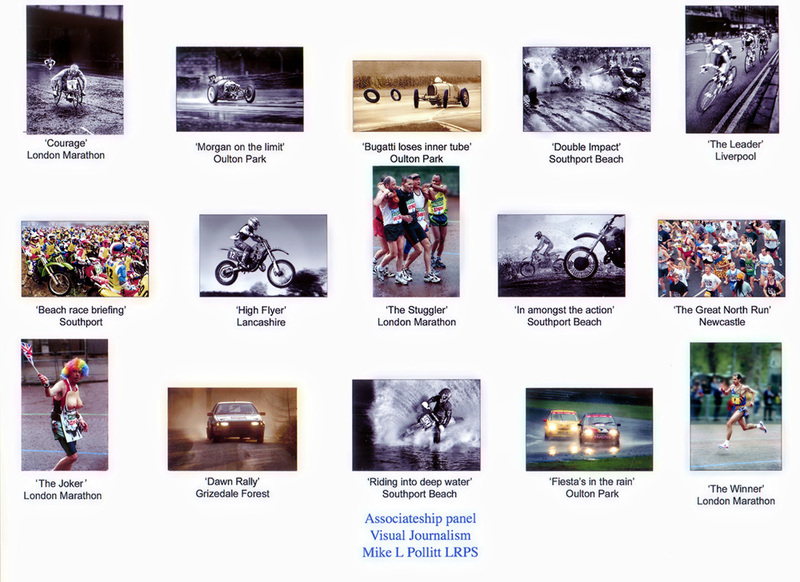 I like all sorts of photography but my first love was Motorcycle racing followed by any sort of motorsport. I spend may hours sat at my beloved Mac enjoying image manipulation. The picture above is me in my youth on my very first motorbike, note the 'L' plate, an ex WD 350 Matchless bought from Pride & Clarke in London for £39.50d. I picked it up from my local British Rail Goods Depot on my 16th birthday. The bike was covered, top to bottom in khaki paint, I think they must go round them with a spray gun just before they dispatch them. I could not start it up and had to push it half way home before running down a railway bridge I managed to get it going and the damed thing nearly ran away from me. I painted it black and put the silver line on the tank and on the toolbox I wrote "Don't laugh, you may be old yourself one day" I had that bike for quite a few years......... Great times. Click on the section headings at the top to see my efforts, and thanks for looking in! Below is my successful panel of prints which gained me an Associateship of the Royal Photographic Society (ARPS) in March 2003.